Shoes: Zigi Soho, Off Broadway. About this outfit. I don't know why I don't wear this dress very often. I bought it for a summer wedding a few years ago, and it's been languishing in my closet ever since. I couldn't bring myself to get rid of it because it's got such a beautiful neckline and I love the way it fits me. A year ago, I would have classified this as an "Easter Sunday" kind of dress, because it's got that kind of pattern that can be interpreted as too saccharine. 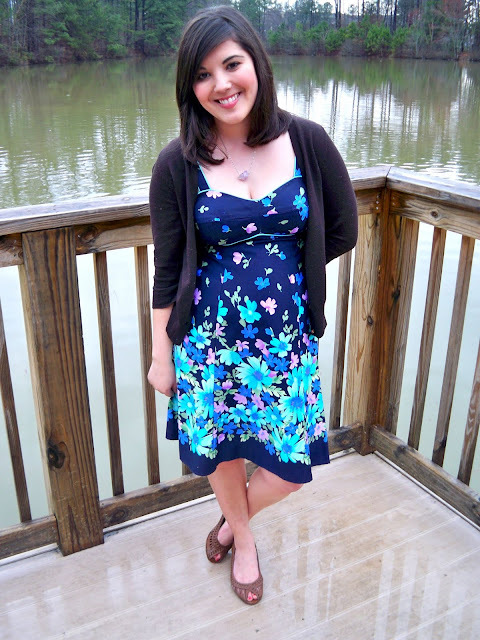 I think the inspiration from the blogosphere is helping me gain confidence in what I really want to wear. Alright, lovelies, have a good weekend! 14 down, 31 to go. the dress is so cute. and you look so adorable in it !! Great date night dress---fits you so well! :) And the boyfriend and I both love TGIFridays ha! I adore the neckline of that dress!! :) Super sweet(heart). hee hee.. Beautiful necklace as well. I hope you're having a great weekend. I am so in love with this dress. I think it might be my favorite since you started the dress project. You should definitely wear it more often. this is a great color and shape on you- you definitely should wear this more often. You are making me think I may want to do a dress project as well! You have the most amazing dress collection - I love the color and print on this one! And that necklace is so beautiful - amethyst is my birthstone, so I always love anything that incorporates it. I love this dress! The print is fantastic and the color is perfect on you. You have such a fantastic selection of dresses! I love the pattern on the dress and the necklace is so pretty! I love Tim Burton as well and I liked Alice in Wonderland but I felt like something was missing..I'm not sure what though. But, it was a well done movie! You made it to dress #14! woot! Keep it up girl- you look fabulous in them! You have the best smile ever! I love this dress on you. this is totally adorable you look so sweet and cute :) that necklace is awesome too I love un shaped stone! oh i love this dress and the shape on you is perfect! Such a sweet dress. Perfect for date night! yes- you must keep this dress... it is so beautiful on you! The shape is just perfect. Oh wow, the sweetheart neckline is SO flattering on you! You look amazing :) And I love your necklace as well!! That dress was *made* for you! And that necklace is SO cool. Thank you so much, JoAnn! You look beautiful and the necklace goes so perfectly with your pretty dress :) Plus, I have a pair of vintage shoes that look just like yours!